Build a teepee around newsprint or fire sticks and establish a strong coal bed. 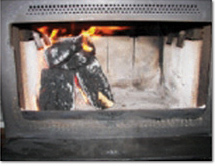 This is the first step to firing any type of wood stove or fireplace fire. Enviro-bricks are a very dry all-wood product. 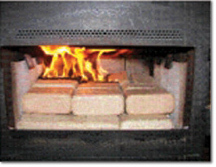 Use only in well maintained stove or fireplace and control air flow to prevent overheating and extend burn times. Push coals into mouth of rear combustion chamber, covering it by as much as two thirds. Build a wall of bricks in front and over coals, packing bricks tight together and laying them flat as much as possible. Stay behind fire irons with fuel. Once fire is going well close damper to direct air flow through mouth of rear combustion chamber. Start teepee in fire box and establish strong coals. Push coals to back corner of stove and build wall in front of and over coal bed, laying Enviro-Bricks flat and tight together. Alternate stacking “ENVIRO” insignia facing forward and sideways to further cut down on air flow through stack. Enviro-bricks grow slightly when burning. Do not pack too closely to glass or top lid. Always maintain some flame in the firebox. 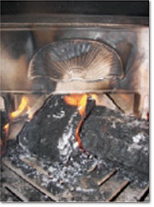 You need to burn the smoke (with flame) in order to extract heat from the wood. You should see little or no smoke in the chimney. Please recycle the wrap in which the Enviro-Brick are packaged at a recycling center near you.